The figure at the top of the page shows two flow visualization techniques, tufts and surface oil flows. The low speed inlet shown in the photo uses tufts, which are described on a separate page, on the yellow external surfaces. Colored oil flows are used on the silver internal surfaces to visualize the flow down the duct. Surface oil is applied as small dabs of oil at some upstream location. The oil is standard 40W treated with a flourescent dye or pigment. The thickness of the oil can be modulated using naptha or 60-70W oil. As the air flows over the model, the oil is carried downstream in long streaks. A variety of pigments aid in flow visualization. Flourescent pigment can be illuminated with a black light for greater visibility with photography. 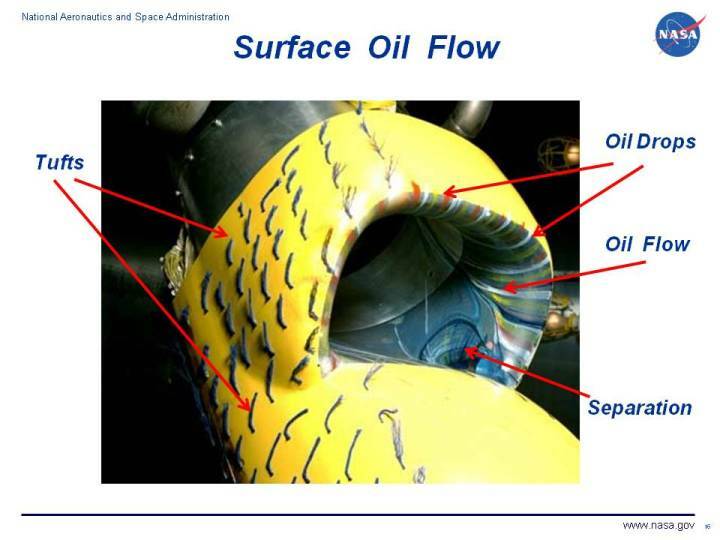 Surface oil flows will indicate the boundary of a flow separation since the oil cannot penetrate the separation boundary. In the photo, a separation is present inside the inlet at the corner of the inlet and forebody. Because of the variation in skin friction between a laminar and a turbulent boundary layer, surface oil treated with napthalin can be used to determine the transition point on a model. Oil downstream of the transition point will be swept away. Some skill and experience is required to properly place the oil dabs, and some clean-up is required when the test is completed. A wind tunnel test using surface oil flow would proceed as follows. The oil is applied with the tunnel stopped. The crew then leaves the tunnel, seals the tunnel, turns on the motor, and brings the tunnel up onto the test condition. When the surface oil flow streaks are properly established, the tunnel is stopped, the tunnel is opened, and the crew quickly photographs the streaks. The oil must be applied with the correct thickness so that it generates a streak of some meaningful length, but does not pool when the tunnel is stopped. Again, skill and experience is needed to obtain meaningful data.